Posted on September 6, 2011 by IASUS_CONCEPTS wrote in Press Release. It has 0 Comment. Can you hear me now? 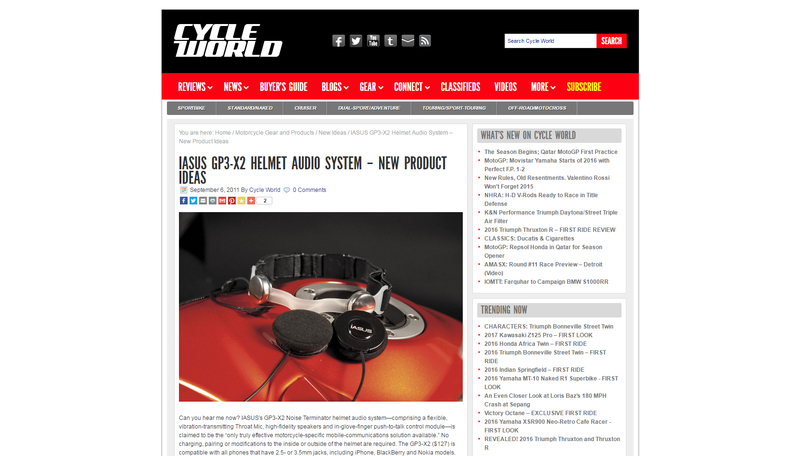 iASUS’s GP3-X2 Noise Terminator helmet audio system—comprising a flexible, vibration-transmitting Throat Mic, high-fidelity speakers and in-glove-finger push-to-talk control module—is claimed to be the “only truly effective motorcycle-specific mobile-communications solution available.” No charging, pairing or modifications to the inside or outside of the helmet are required. The GP3-X2 ($127) is compatible with all phones that have 2.5- or 3.5mm jacks, including iPhone, BlackBerry and Nokia models.